Sport Series Bullnose: Provides outstanding protection for your vehicle while giving it that custom offroad look that is popular today. 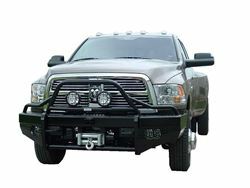 The 15K winch option comes standard with a ?" formed channel bumper and holds up to a 16,500 lb Warn winch. Comes standard with 2" receiver and durable black powder coat finish.